To better serve our customers, Modineer has developed a metal finishing division. 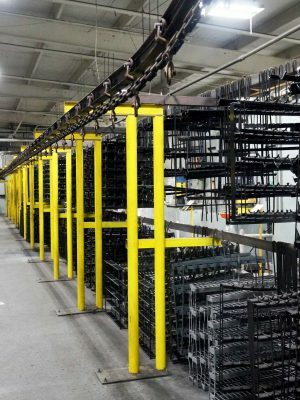 Powder Coating and E-coating lines have been installed and operate in our Benton Harbor, MI locations. Alongside this, a CARC painting facility is in operation in our South Bend, IN facility. We have the capacity to coat parts made by Modineer, as well as parts for paint-only customers. Modineer’s Coatings Division is a 98,000-sq.ft. facility that offers electrocoating and powder coating services. We are ISO 9001 certified. We are located right off I-94, making us extremely accessible to provide quality service, and on time deliveries. Our focus is servicing the automotive industry, but our talent and expertise allow us to service a wide range of needs. One of the many benefits of utilizing the Modineer Coatings Division is that we exceed the stringent automotive industry standards. We achieve this by running all our parts through an 8-stage pretreatment process. We have on staff a PPG certified chemical specialist in-house that monitors all pretreatment chemicals, as well as our paint tanks, to make sure we are exceeding our standards. All our coatings pass a 1000-hour salt spray test. Modineer Coatings Division works hard to provide not only quality but service as well. We can offer next day quotes on jobs of all sizes. We also have a quick 72-hour turnaround time that ensures that our customers can make the best strategic decisions as possible. Our fabrication shop allows us to custom build racks specifically for your needs. This gives us the flexibility to run many different parts of differing size, shape, weight, colors, textures, electro coats and/or powder coats. Our Powder Coat line can handle parts as large as 50″ x 30″ x 48″, with a maximum part weight of 250 pounds. Our unit incorporates a five-stage spray wash pretreatment system fed by an overhead monorail conveyor. After cleaning, parts enter a forced air dry-off oven and then pass through an environmental room. Within this room, a dry powder made of a finely ground mixture of pigment and resin is applied. The electrostatically charged powder adheres to the metal as it is passed through a convection cure oven where it is melted and fused to the part. These systems were designed to coat both medium and high-volume parts efficiently, using both manual and automatic equipment. Powder coating produces a high-quality finish that will make your metal products durable, attractive, scratch, and corrosion resistant. A powder coated part, properly installed and maintained, should be relatively permanent. A powder coat finish will not crack, chip or peel as with conventional paint films. A high production E-Coat line is installed in our Benton Harbor, MI facility. The unit incorporates a five-stage spray wash pretreatment system that is fed by an overhead monorail conveyor. Our E-Coat line can handle part sizes of 30″ X 40″ X 60″ and a package load of 250 lbs. After cleaning, parts are submerged in our E-Coat tank, followed by a two-stage rinse system, which is followed by a dehydration oven and final cure over. This all happens while never being handled or leaving our overhead conveyor system. A Modineer E-Coat is a superior undercoating method due to the part being dipped in a paint tank. This allows the paint to flow into hard to reach areas that could not be painted with a spray application. It is electroplated onto the metal and then fully cured in an oven. E-coat combined with powder coating provides an exceptionally high-quality corrosion and scratch resistant finish for your metal products. CARC creates a non-porous coat on metal products that provide resistance to radioactivity and biological contaminants seen in chemical warfare. These coatings can also withstand the corrosive nature of the decontaminating chemicals used to wash down military equipment. CARC systems will extend the service life of military equipment and vehicles. Modineer can pre-treat and coat parts to various military specs including TT-C-490, MIL-DTL-5541 and MIL-DTL-53072 (CARC). Modineer has made every effort to set a new standard in the CARC paint industry. Our goal is to provide high-quality CARC coating service to the defense industry by utilizing new technology and constantly refining our processes and procedures. We have the capability to process parts through an overhead conveyor coating system. Our CARC system line can handle part sizes of 70” x 76” x 36″ and a package load of 250 lbs.